Thermostatisierbarer Säulenofen der Baureihe 1100. Lieferung mit Powerkabel und CAN- Kabel. 1100 Säulenthermostat von 10 Grad Celsius unter Raumtemperatur bis + 80 Grad Celsius. Enthält Säulenthermostat mit zwei Wärmetauschern für die Lösungsmittel-Vortemperierung und CAN Kabel. 1100/1200 Thermostatted Column Compartment Includes column compartment with two heat exchangers for solvent pre-heating, column identification module and CAN cable. 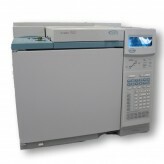 The Agilent 1100/1200 Series thermostatted column compartment fits in a single stack for lowest bench space requirements. The standard 1100/1200 Series thermostatted column compartment for temperatures up to 80 °C. Maximum application flexibility and stability is achieved by Peltier cooling and heating. Three full-length, 30-cm columns fit inside the spacious column racks. Faster operation for lower laboratory costs with simultaneous column identification for two columns. Independent heat exchangers - two temperature zones possible with independent right and left setpoints by independent heat exchangers. Low dispersion - optimized for low internal volume contribution, just 9 µL. Ceramics for long lifetime - optional high quality Rheodyne® column switching valve with ceramic stator-face assemblies.